AT least 23 people were arrested in connection with violent riots that broke out when a far-right anti-Islam activist threw a copy of the Koran in the air. 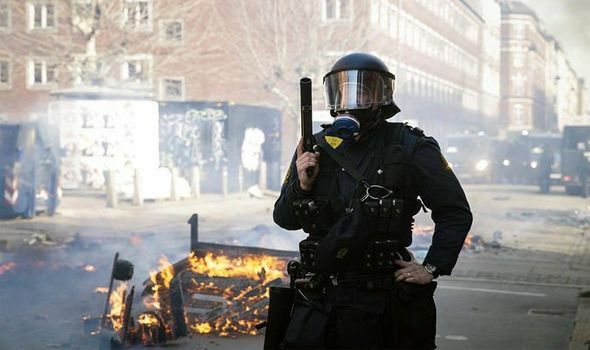 Police threw teargas after missiles were thrown at them when the unrest spread on Sunday to several parts of Copenhagen, Denmark. Rasmus Paludan, the founder of the anti-immigrant party Hard Line, held a demonstration calling for Islam to be banned from Denmark. He had thrown the holy book more than once in Noerrobro, which is an anti-immigrant area in the capital. Prime Minister Lars Lokke Rasmussen he condemned Mr Paludan’s “meaningless” actions. He said on Twitter: “I strongly disagree with Paludan’s meaningless provocations that have no other purpose than sow disunity. “Meet him with arguments – not with violence. Mr Paludan had cobblestones thrown back at him by counter-protestors, before police then took him away. He was not injured in the violence, according to Danish broadcaster TV2. Dustbins and bicycles were also set on fire as the riots spread to other areas in Copenhagen. Police warned people to stay away from the affected areas or indoors for their own safety. The Hard Line group believes Denmark should be a country for people who are “ethnic Danes at birth”. They also should have “Danish genus and Danish native language”. Mr Paludan has already been handed a suspended sentence for racist abuse and his party also does not have any seats in the Danish parliament.